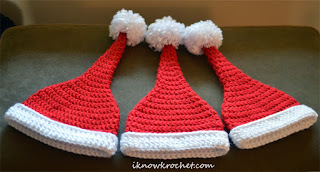 An adorable Santa hat for babies was the very first thing that inspired me to learn to crochet. I learned how to crochet in time to attempt to make a Santa hat for my baby last December. Although I started a Santa hat, I never finished it. The pattern I was using called for a 3.25mm hook and single crochet stitches throughout the hat. At the time, I was crocheting too tightly (so my gauge was off) and I crocheted slowly (still do). Needless to say, the project did not progress very quickly. My first Santa hat is currently hibernating and I no longer need it for my own child. 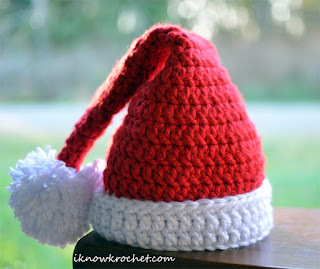 I don't need it this year because I designed my very own Santa hat that is very fast and easy to work up! Based on my previous experience, I set out to design a hat that could be completed in the shortest amount of time possible. Therefore, I started with a super bulky yarn and used double crochet instead of single crochet stitches. After perfecting the pattern, I was able to complete the entire hat in about an hour! 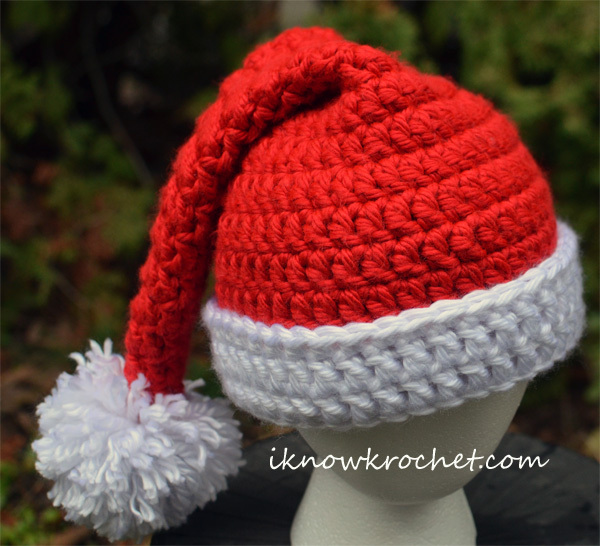 This Santa hat pattern has a couple of special features, including a folded brim and long tail that can be made in any length to look more like an elf hat than the traditional Santa hat style, if desired. This is my first hat pattern and I think it turned out pretty cute. 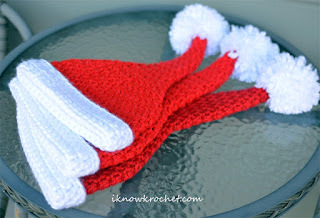 This Santa hat pattern is so fast and easy that I had time to make one for everyone in the family! I made it in three sizes: toddler, child, and adult. Make sure to match lot numbers! Note: this hat stretches. Size range includes actual circumference plus 2 inches. height to beginning of tail including brim: 7.5"
height to beginning of tail including brim: 8"
Pattern is worked in the round. Turning chains are not counted in the total stitch count. The first stitch of each row should be worked in the same stitch as the turning chain. The sl st at the end of each row is worked into the first dc of the same row. In other words, after making the turning chain, just pretend that it isn't there. Working in back loops only of round 22 creates a natural spot to fold the brim. When the brim is folded, there should be an equal number of rounds of white on the inside and outside of the fold. All stitches should be "right side out" to match the red part of the hat. This is a modified version based on tips from various sites. The sites with the original photo tutorial/tips are referenced in the links. My additional modifications to make a secure pompom using super bulky yarn are depicted in the numbered photos below. There will be four loose ends of worsted weight yarn. Hold the two ends together from each side. Weave two adjacent strands (held together as one) down through the magic circle and around a single crochet stitch from round 1. Do the same for the other two strands on the opposite side. Tie a tight double overhand knot. Weave loose ends into the tip of the hat tail and lose them inside the hat (no need to weave them in after they are inside the hat). Working in back loops only of round 24 creates a natural spot to fold the brim. When the brim is folded, there should be an equal number of rounds of white on the inside and outside of the fold. All stitches should be "right side out" to match the red part of the hat. Working in back loops only of round 25 creates a natural spot to fold the brim. When the brim is folded, there should be an equal number of rounds of white on the inside and outside of the fold. 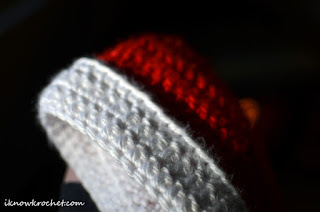 All stitches should be "right side out" to match the red part of the hat. Matching lot numbers is important! 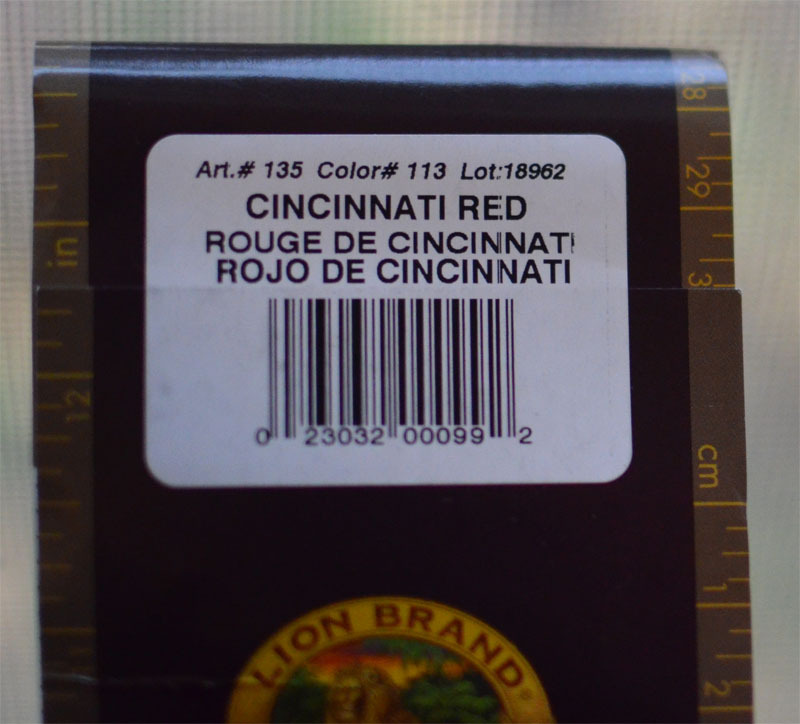 I made a mistake by not paying attention to lot numbers when buying multiple skeins of red yarn. 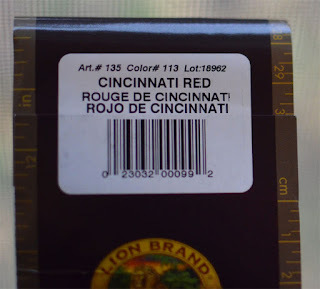 There is definitely a color difference between some skeins with different lot numbers (this difference may not be very noticeable between some lots, but significant between others). All sizes of this hat require slightly more than one skein of red yarn to complete. Because I had been working under less-than-ideal lighting conditions, I didn't notice the mismatched rows until after making my first two hats. Although the color difference was subtle, it bothered me, so I "frogged" (ripped out the stitches) the white brim, excised the mismatched red parts, and remade those parts using the correctly matched yarn (after making a trip to my local craft store to exchange the yarn; luckily, the correct lot numbers were still available at the store). If you look closely in some of the photos, there is a color difference in the largest hat compared to the smaller two hats, which is OK with me as long as the same color is used within a given hat. 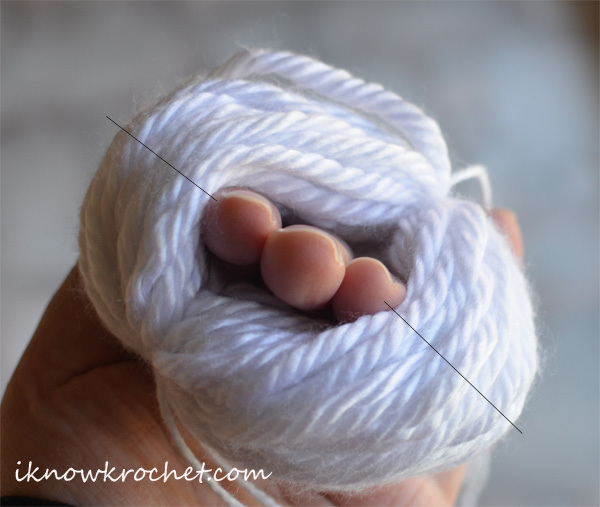 Since I first learned to crochet, I've always thought that the "right" way to change colors is to avoid making knots and just crochet over the loose ends after switching to a new color of yarn. However, the ends always stick out when I use this method with super bulky yarn. This time, I just tied the ends together in a knot to join two different colors and it was much easier to hide the loose ends (I just made sure to keep them on the inside of the hat). Also, making the color change on the second yarn over of the last double crochet makes a very clean, unnoticeable color change (this is also noted in the pattern). The pompom was based on tips from other sites, but I added some of my own modifications to make a more secure pompom using super bulky yarn. Other sites (see above links) suggested using a surgeon's knot and a smaller sized yarn to tie the pompom. 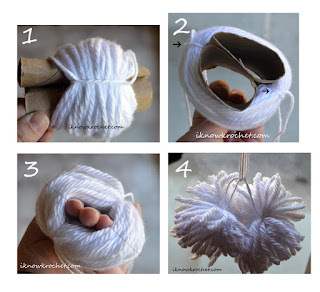 While these techniques are very useful, my pompom was still pretty loose when I wrapped the yarn around the toilet paper rolls 60 times. So I did some experimenting to try and get an even more secure pompom. 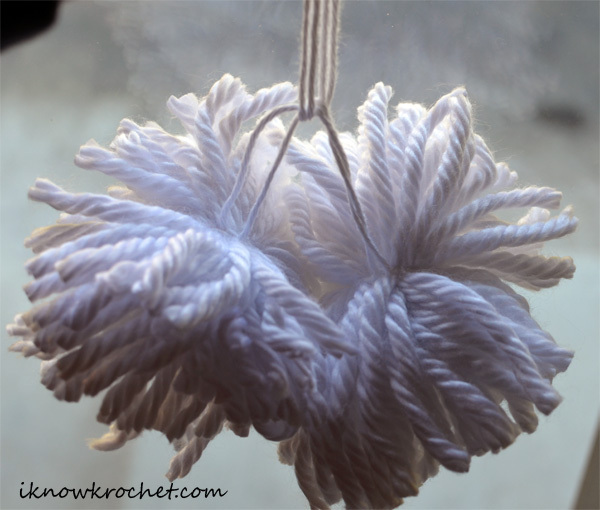 I found that cotton (worsted weight) grips the 100% acrylic super bulky yarn very well, making it easier to tighten the knot and keep it from loosening. Additionally, by tying each half of the pompom separately, I effectively reduced the total number of strands that needed to be tied to 30 (half of 60), thus allowing for a tighter knot. I made the two pieces from a single wraparound (rather than making two completely separate pompoms) so that the sides would fit perfectly together to make a round ball. These techniques made for a very secure, super fluffy pompom. Yes, a determined toddler can still pull out the strands, but the super bulky yarn won't be falling out on its own when you secure the pompom this way. I hope to get a lot of use out of these super bulky Santa hats this Christmas season, starting with our tree hunt next weekend! The hats are very warm so they will be perfect for the cold weather. Santa elf hat this holiday season?